While Woolworth is particularly known for its cover versions of the hits of the Sixties, released on its own Embassy label, it also took many other steps to embrace teen culture and remain up-to-date during the period. Some of its Beatles memorabilia remains particularly collectable today. 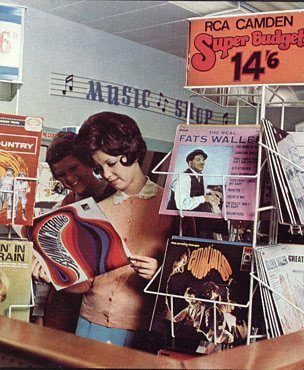 At the time Woolworth didn't sell chart music on either side of the Atlantic. 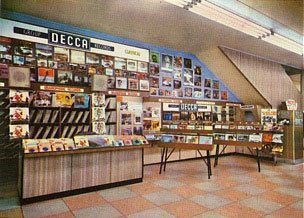 In the USA some stores sold bin ends of 45s and cartridges, while the British stores had built a strong following for cover versions recorded by unknown artists at a studio in New Bond Street, in fashionable Mayfair and rushed out to the shops on the same day as the official 'hit'. A 2009 BBC radio documentary The Wonderful Sound of Woolies tracked down some of the original artists. Most had sung with 'The Typhoons; and had recorded Beatles covers, and revealed that the 'group' had consisted of whatever artists happened to be at the studios on the day. It seems Embassy's Fab Four was actually a Fab Fifty! Embassy's Beatles covers are perhaps the label's best 'hits'. Even critics admit that The Typhoons did the songs justice, despite the cheap price. Some people loved these covers, others absolutely hated them. Whatever your perspective, they are highly collectable today! Singles 4/3 (21p) EPs 6/11 (34p). Oriole, the recording company that Woolworths hired to mastermind the Embassy Records initiative, showed lots of initiative in marketing the line. They successfully made the transition from shellac 78s from 1954 to vinyl 45 rpm singles from 1958 and continued to innovate during the Sixties. To bolster sales they introduced EPs (Extended Play records) which allowed them to squeeze four songs onto one single instead of the usual two, and gave them the chance to give the most popular songs a second release. These EPs were often given picture sleeves to improve their appeal and were sometimes advertised in the press. 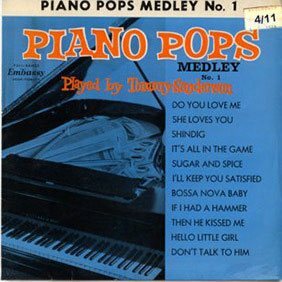 Building on the success of picture sleeved EPs, they began compiling full LPs of the songs sometimes as a 'Juke Box' and sometimes linked to a film or theme. These proved a big hit in Woolworths stores, particularly at Christmas. 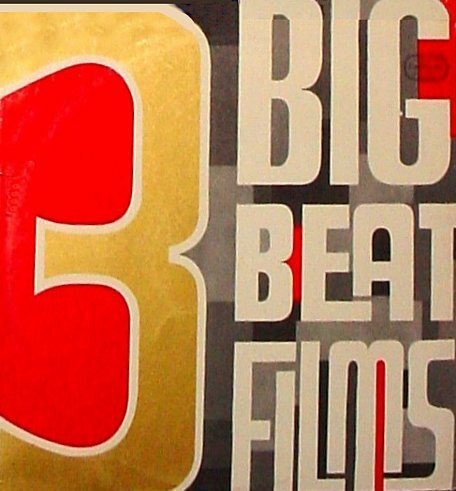 Some people credit them with prompting the rise of budget compilation albums from labels like Camden, K-Tel and Ronco. Some of the Embassy songs went on to become hits on the Continent as Oriole leveraged their investment by releasing the best titles in Belgium to some acclaim. If you would like to hear some of the songs, please visit our Virtual Juke Box feature and see what you think!. 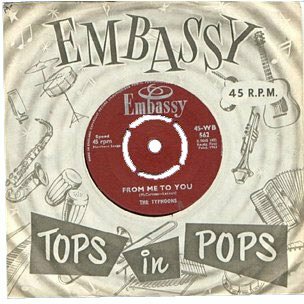 The extended play (EP) and long playing (LP) formats helped to keep Embassy going well into the Sixties, despite the rapid changes in taste during the period. The instrumentals and language courses were very popular. But, with the disposable income of young people increasing and the birth of the style generation, cover versions were looking increasingly outdated. By 1965 people wanted the real thing. The firm set about designing a new music department for the new age. For the first time the company would stock chart music, sourced initially through EMI Records Ltd and Decca Records. (EMI later floated their wholesaling business as Record Merchandisers Ltd and it later became Entertainment (UK) Ltd., a subsidiary of Woolworths Group plc, and, for some, the Achilles Heel that ultimately brought the whole business to its knees. The first full Entertainment offer in Britain was in the refurbished store at Gallowtree Gate in Leicester. The displays were brightly coloured and highly distinctive compared with Embassy. The product selection incuded a small amount of chart music, but mainly focused on back catalogue titles. 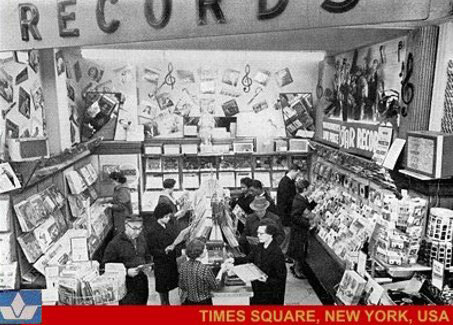 The American parent company developed a larger music offer for its huge superstore in Times Square, New York. This was a big hit with the public. The wall browser fixtures, topped with display boards still appear quite modern today, half a century after the picture was taken. By 1969 the modern entertainment offer was beginning to take shape in the UK. 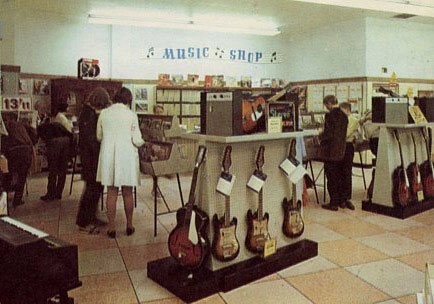 Among the most popular items in the range were electric guitars and amplifiers for budding rock stars. Chart music was supplemented by budget titles from Hallmark, RCA Camden and the new Music for Pleasure (MFP) label from EMI. Each offered a mixture of albums from real artists and cover versions. Embassy faded into the distance to become highly collectable in the third millennium.